Pisum sativum L., the common pea (also known as the garden or field pea), is an herbaceous annual in the Fabaceae (formerly Leguminosae) family, originally from the Mediterraean basin and Near East, but now widely grown for its seedpod or legume (a simple dry fruit containing several seeds and splitting along seams on two sides). Pisum sativum is an annual plant, with a life cycle of one year. It is a cool season crop grown in many parts of the world; planting can take place from winter to early summer depending on location. The average pea weighs between 0.1 and 0.36 grams. The immature peas (and in snow peas the tender pod as well) are used as a vegetable, fresh, frozen or canned; varieties of the species typically called field peas are grown to produce dry peas like the split pea shelled from the matured pod. These are the basis of pease porridge and pea soup, staples of medieval cuisine; in Europe, consuming fresh immature green peas was an innovation of Early Modern cuisine. The term “Pea” originates from the Latin word pisum, which is the latinisation of the Greek πίσον (pison), neuter of πίσος (pisos) "pea". It was adopted into English as the noun pease (plural peasen), as in pease pudding. However, by analogy with other plurals ending in -s, speakers began construing pease as a plural and constructing the singular form by dropping the -s, giving the term pea. This process is known as back-formation. Pisum sativum is an annual plant, with a life cycle of one year. It is a cool season crop grown in many parts of the world; planting can take place from winter to early summer depending on location. Pisum sativum cultivars are either low growing (less than 0.75 meters) or vining. The vining cultivars grow thin tendrils from leaves that coil around any available support and can climb to be 1-2 m high. Pea is a quick growing, annual herbaceous vine which requires trellis to support its growth. It flourishes under well-drained, sandy soil supplemented with adequate moisture and cool weather conditions. Short stalked, green pods appear by late winter or early spring. The leaves are alternate, pinnate with 1-3 pairs of leaflets and a terminal branched tendril leaflets ovate or elliptic, 1.5-6 cm long. Stipules are large, leaf-like and up to 10 cm long. The leaf type could be conventional, semi-leafless and leafless. Leaf size in most cases increases up to the first node bearing the first flower. Flowers borne on the same peduncle produce pods that mature at different times, the youngest being at the tip. On a whole plant basis, flowering is sequential and upwards from node to node. The node at which the first flower emerges is characteristic of a given variety; in temperate regions the number of nodes at which the first flower emerges is reported to vary from 4 in the earliest to about 25 in late maturing types under field conditions. The distinctive flower has 5 fused sepals, 5 petals, 10 stamens (9 fused in a staminal tube and 1 stamen is free), and one carpel, which develops into a pod with multiple peas. Corolla is white, or pink, or purple. Pea is a self pollinated annual herb. The fruit is called pod. Pea pods are botanically fruit, since they contain seeds and developed from the ovary of a (pea) flower. Each pod measures about 4-15 cm long, 1.5-2.5 cm wide, swollen or compressed, straight or slightly curved, filled with single row of 2-10 light-green, smooth edible seeds. Each pod contains several seeds called peas. A pea seed is a most commonly green, occasionally golden yellow, or infrequently purple pod-shaped vegetable, widely grown as a cool season vegetable crop. Seeds are globose or angled, smooth or wrinkled, exalbuminous, whitish, gray, green, or brownish. The average pea weighs between 0.1 and 0.4 grams. It germinates cryptocotylarly. The seeds may be planted as soon as the soil temperature reaches 10 °C (50 °F), with the plants growing best at temperatures of 13 to 18 °C (55 to 64 °F). They do not thrive in the summer heat of warmer temperate and lowland tropical climates, but do grow well in cooler, high altitude, tropical areas. Many cultivars reach maturity about 60 days after planting and 100 days to mature the dry seed. Based on genetic diversity, four centers of origins, namely, Central Asia, the Near East, Abyssinia and the Mediterranean have been recognized (Gritton, 1980). Peas were reported to be originally cultivated as a winter annual crop in the Mediterranean region. Today, this versatile legume is one of the major commercial crops grown all over the temperate, and semi-tropical regions. Peas require a cool, relatively humid climate and are grown at higher altitudes in tropics with temperatures from 7 to 30°C. Temperatures above 27°C shorten the growing period and adversely affect pollination. In the tropics and subtropics, field pea is planted at high elevations where the temperatures remain cool. The moisture requirement for field pea is similar to that for cereal grains. Good rains and/or early irrigation, and no rain during pod fill and ripening is ideal. Hot weather during flowering causes the flowers to blast which results in reduced seed set. 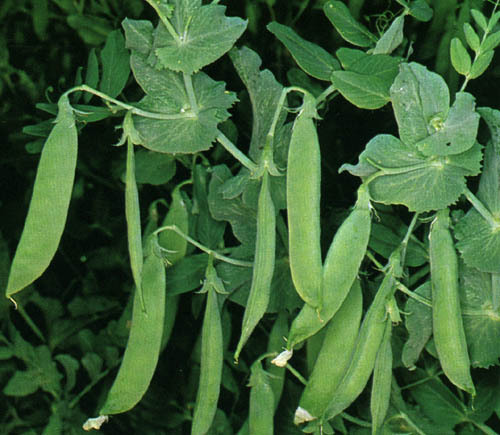 Field pea seedlings can withstand considerable frost exposure without damage. If frost injury does occur and the main shoot is killed, new shoots will originate from nodes below the soil surface. In temperate climates, where winters are severe, the crop is usually planted in the spring. Where there are little or no frosts, planting occurs in the late fall and early winter. On average, it requires 60 days from planting until bloom, and 100 days to mature the dry seed. For very early crops, a sandy loam is preferred; for large yields where earliness is not a factor, a well-drained clay loam or silt loam is preferred. Peas are starchy, but high in fiber, protein, vitamin A, vitamin B6, vitamin C, vitamin K, phosphorus, magnesium, copper, iron, zinc and lutein. Dry weight is about one-quarter protein and one-quarter sugar. Pea seed peptide fractions have less ability to scavenge free radicals than glutathione, but greater ability to chelate metals and inhibitlinoleic acid oxidation. Peas are low fat but high everything else. A cup of peas has less than 100 calories but lots of protein, fiber and micronutrients. Source: 10 Health benefits of peas. By the 17th and 18th centuries, it had become popular to eat peas "green", that is, while they are immature and right after they are picked. This was especially true in France and England, where the eating of green peas was said to be "both a fashion and a madness". New cultivars of peas were developed by the English during this time, which became known as "garden" or "English" peas. The popularity of green peas spread to North America. Thomas Jefferson grew more than 30 cultivars of peas on his estate. With the invention of canning and freezing of foods, green peas became available year-round, and not just in the spring as before. The immature peas (and in snow peas the tender pod as well) are used as a vegetable, fresh, frozen or canned; varieties of the species typically called field peas are grown to produce dry peas like the split pea shelled from the matured pod. These are the basis of pease porridge and pea soup, staples of medieval cuisine; in Europe, consuming fresh immature green peas was an innovation of Early Modern cuisine. In modern times peas are usually boiled or steamed, which breaks down the cell walls and makes the taste sweeter and the nutrients more bioavailable. Along with broad beans and lentils, these formed an important part of the diet of most people in the Middle East, North Africa and Europe during the Middle Ages. Fresh peas are often eaten boiled and flavored with butter and/or spearmint as a side dish vegetable. Salt and pepper are also commonly added to peas when served. Fresh peas are also used in pot pies, salads and casseroles. Pod peas (particularly sweet cultivars called mange tout and "sugar peas", or the flatter "snow peas," called hé lán dòu in Chinese) are used in stir-fried dishes, particularly those in American Chinese cuisine. Pea pods do not keep well once picked, and if not used quickly, are best preserved by drying, canning or freezing within a few hours of harvest. Pea soup is eaten in many other parts of the world, including northern Europe, parts of middle Europe, Russia, Iran, Iraq and India. In Sweden it is called ärtsoppa, and is eaten as a traditional Swedish food which predates the Viking age. This food was made from a fast-growing pea that would mature in a short growing season. Ärtsoppa was especially popular among the many poor who traditionally only had one pot and everything was cooked together for a dinner using a tripod to hold the pot over the fire. In Chinese cuisine, the tender new growth [leaves and stem] (dòu miáo) are commonly used in stir-fries. Much like picking the leaves for tea, the farmers pick the tips off of the pea plant. In Greece, Tunisia, Turkey, Cyprus, and other parts of the Mediterranean, peas are made into a stew with meat and potatoes. Processed peas are mature peas which have been dried, soaked and then heat treated (processed) to prevent spoilage - in the same manner as pasteurising. Cooked peas are sometimes sold dried and coated with wasabi, salt, or other spices. The wild pea is restricted to the Mediterranean basin and the Near East. Wild field pea can still be found in Afghanistan, Iran and Ethiopia. The earliest archaeological finds of peas come from Neolithic Syria, Turkey and Jordan. Peas appear to have been cultivated for nearly 7,000 years. In Egypt, early finds date from ca. 4800-4400 BC in the Nile delta area, and from ca. 3800-3600 BC in Upper Egypt. In early times, peas were grown mostly for their dry seeds. From plants growing wild in the Mediterranean basin, constant selection since the Neolithic dawn of agriculture improved their yield. The pea was also present in Georgia in the 5th millennium BC. Farther east, the finds are younger. Peas were present in Afghanistan ca. 2000 BC, in Harappa, Pakistan, and in northwest India in 2250-1750 BC. The pea was one of the earliest cultivated food crops, with pea cultivation spreading throughout Europe, India and China by 2000 BC. In the second half of the 2nd millennium BC, this pulse crop appears in the Gangetic basin and southern India. In the early 3rd century BC Theophrastus mentions peas among the pulses that are sown late in the winter because of their tenderness. In the first century AD Columella mentions them in De re rustica, and Roman legionaries still gathered wild peas from the sandy soils of Numidia and Palestine, to supplement their rations. Apicius, author of Rome's 4 th (or early 5 th) Century first cookbook, has nine recipes for cooking peas, some of which are cooked with other vegetables and herbs, while other methods combine peas with meat, poultry and seasonings. Dried peas became a staple food of European peasants during the Middle Ages. This is because peas were cheap, plentiful and when cooked made an inexpensive, filling, wholesome meal. They could survive storage throughout the long winter months once they had been dried. Charlemagne, the Emperor of France, grew peas in his gardens around 800 AD. In the Middle Ages, field peas are constantly mentioned, as they were the staple that kept famine at bay, as Charles the Good, count of Flanders noted explicitly in 1124. In the 13th century the poet Guillaume de Villeneuve noted J'ay pois en cosse touz noviaux among the street cries of Paris. Green "garden" peas, eaten immature and fresh, were an innovative luxury of Early Modern Europe. At the end of the 14th Century, the Italians had cultivated a dwarf variety of peas called Piselli novelli which were to be eaten fresh. When Catherine de Medici of Italy married Henry II of France in 1533, she brought many of her favourite foods with her, among which were Piselli novelli. The tasty new peas were so different from the peasant fare that a new fashion craze was started in French cuisine. The French called their flavoursome tiny peas petits pois, a name that remains today. The French town-names of Saint-Germain and Clamart were incorporated into the titles of recipes which included petit pois. Non-pigmented peas to be used as a vegetable were grown in United Kingdom in the middle Ages. In England, the distinction between "field peas" and "garden peas" dates from the early 17th century: John Gerard and John Parkinson both mention garden peas. Pea was introduced into the Americas soon after Columbus. Thomas Jefferson, who was elected the third president of the United States in 1800, was an avid gardener, who thought so highly of peas (they were his favourite vegetable) that he cultivated 30 varieties of them. Winter type pea was introduced from Austria in 1922. Many Varieties and cultivars are available ranging from early- to late-maturing and from leafy to leafless. In temperate areas most are for spring sowing but some winter hardy cultivars for sowing with winter cereals have been developed too. Certain cultivars bred for harvesting as grain peas for human or animal consumption are also suitable for sowing pure or in mixture with cereals for arable silage. Some typical cultivars used in Europe are Magnus, Setchey, Solara, Sponsor, Athos, Baccara, Nitoche, Rif and Gracia. Some other examples are Trapper and Austria (Canada) and Mega (New Zealand). There were 183 countries growing the peas on the world in 2012. 4- United States of Ame.